My very first post on this blog, nearly two years ago, was about Alan Turing, and in the intervening time his public profile has continued to grow. That post still appears to be one of my most frequently read ones (which isn’t saying much) – probably because there are so many searches for his name now. You may be aware that a dramatised film of his life was recently released – The Imitation Game – so of course I went to see it. Warning: some spoilers follow. If you don’t want to read on, then I recommend seeing the film, but also taking a monster pinch of salt with you. My expectations weren’t too high after seeing the trailer, and the words splashed across the screen: ‘It took a man with secrets to break the biggest one.’ This suggests elements of the Hollywood-style schlocky mindset that we are all familiar with. However it looked as if Benedict Cumberbatch’s portrayal of Turing had some studied integrity, as indeed I found it did when I saw the film. But I suspect the celluloid Turing had far more exaggerated autistic traits than the real one: there’s no doubt that he was shy and socially awkward, but hardly quite as indifferent to the emotions of others as he was made to appear. As I wrote in that earlier post, his impulses were more often generous and considerate; perhaps an example of this was his breaking off of his engagement with Joan Clarke, his fellow cryptographer at Bletchley, feeling that as a gay man he wouldn’t be able to maintain an adequate marriage. What private conversation took place we will of course never know, but the film version made it more abrupt and brutal than I would have imagined it to be. 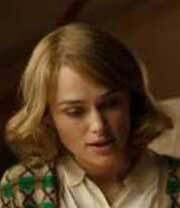 Turing’s biographer, Andrew Hodges, has criticised the film on the portrayal of Joan – played sweetly and demurely by the willowy Keira Knightley. I thought it was a good performance, given her brief (but should someone have told her that a double-first Cambridge maths graduate is not likely to pronounce the name of the great Swiss mathematician Euler as “Yooler” rather than “Oiler”?) I’m getting pedantic – but one of Hodges’ points was that Joan Clarke was stocky and bespectacled – not the ideal of femininity, but as such someone whom Turing would have found a congenial and comfortable companion, as he undoubtedly did. There’s some insight into their relationship in an interview she gave to BBC Horizon in 1992, four years before her death (see video clip at the bottom of this post). I did enjoy the film, although the beautifully realised period settings were marred – as so often – by a cloth ear for the language and idioms of the time. Would a fairly patrician Englishman in the 1940s (Commander Denniston/Charles Dance) have said “You’re fired” rather than something like “I’m sacking you”? And would Joan Clarke have talked about “fixing” Turing’s lamb in an imagined future marriage, rather than “cooking” it? I seem to be turning into one of those people who get their biggest kicks from looking for mistakes in movies; but what the hell – it’s fun, and these are the sorts of things that irritate me. And indeed I became increasingly impatient with the more serious departures from reality. For a start, there’s no evidence at all that anyone attempted to fire Turing – this was just a ladle of dramatic tension clumsily poured in to spice things up. And so it went on. Apart from some clerical help by the Wrens, the entire wartime decryption operation was down to four men, one woman and a single machine which Turing built almost single-handed as well as designing it. He named the machine ‘Christopher’ after his close school friend who had died, and that the machine was a sort of emotional substitute after this loss (as was a computer he later designed in Manchester). 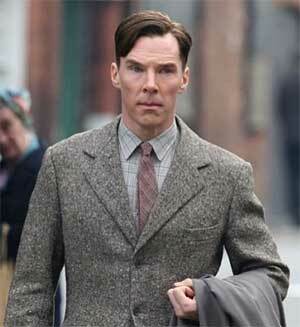 Turing was effectively blackmailed by the Soviet spy John Cairncross into keeping quiet about Cairncross’s activities. These range from the absurd, through the highly improbable, to the patently false; and I have only picked out a few of the most egregious examples. Just to examine one of them: it’s true that the spy Cairncross was at Bletchley and passed details of decrypts to Stalin’s Russia. 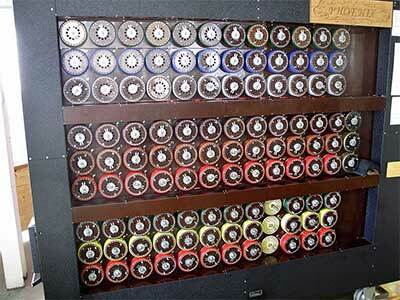 But these were not Enigma decrypts, but those of the later, more complex naval code known as ‘Tunny’, broken by Bill Tutte and decrypted by the ‘Colossus’ computer designed by Tommy Flowers – an operation which of course owed much to Turing. It’s unlikely that Cairncross would have met Turing or had any significant contact with him; but how the thought of livening up the dull old truth with a bonus spy gets those film writers’ pulses racing! According to the film, the good old Brits of course know what Cairncross is up to, and only let him release the material that suits their purposes. (How on earth they manage this without his knowledge, given that the character in the film has full access to the Enigma decrypts, is never explained.) In reality, Cairncross’s activities were not discovered until the 1950s. And of course there wasn’t just one machine (they were actually known as ‘bombes’) but eventually some 200 of them were installed, at Bletchley and elsewhere, to get through all the work. I don’t think any of them was called ‘Christopher’. As is customary with fictionalised true stories, we get the ‘what happened afterwards’ follow-up facts on the screen before the credits – but even these are sloppily inaccurate: the Bletchley code breaking activities, we are told, were kept secret for more than 50 years. The makers have apparently failed to notice that the Hodges biography on which they claim to base the film, and which describes Enigma in great detail, was published in 1983, less than 40 years after the war. And the existence of the Bletchley code breaking operation was in fact made public in the 1970s, nearly a decade before that. There I go again; but the point at issue is whether all the distortions of the truth can be justified. The film’s producer Teddy Schwartzman has been quoted as saying that, while the makers did not want to fabricate events, there are some ‘creative liberties’. Well, that’s one way of putting it. More, I would say, that many important truths were distorted in the hope of pushing up box office receipts. I haven’t attempted to count the fabricated events, but I doubt whether the fingers of both hands would be sufficient. I don’t imagine that Turing himself, with his mathematician’s love of detail, would have been very happy with this portrayal. The truth of Turing’s life contained drama enough – it was unnecessary to daub the picture with splotches of gaudy dramatic invention and make such clumsy attempts to drag in a spurious emotional subtext. In a different way, the film was as disobliging to his memory as the account by his prejudiced brother John which I described in my first blog post. Not another description of me, looking out of the window of my commuter train, but a few thoughts prompted by looking at some early film footage. A recent programme on Channel 4 looked at the rise of Hitler, using contemporary film from the 1920s and 1930s, which had been digitally enhanced and colourised to a startling level of realism. The thoughts I wanted to share concern not the subject of the films, but the medium itself. Most people have some awareness of the early history of moving pictures, the notion having been conceived almost as early as photography itself. 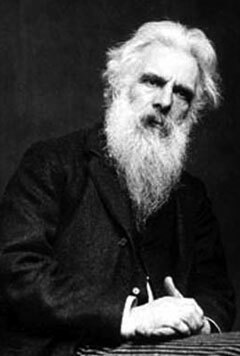 Probably the first pioneer of the medium was the somewhat eccentric, but evidently brilliant, Edweard Muybridge. (He had changed his name – as he did several times – from the original Edward Muggeridge). Born in England, he lived for most of his life in the USA, where on his first visit he suffered a near-fatal blow on the head in a stagecoach accident. He recovered, but perhaps this accounted for some of the eccentricity. Some years later, in 1875, on he was tried, again in America, for murder, having shot dead his young wife’s lover. The defence entered a plea of insanity, but he rather gave the lie to that with a speech on his own behalf which was both cogent and impassioned enough to sway the jury to acquit him with a verdict of ‘justified homicide’. Having started his career as a bookseller he later became a professional photographer, and in 1872 he was commissioned to settle a debate over whether all four hooves of a cantering or galloping horse were ever out of contact with the ground simultaneously. Having established by means of still photographs that they indeed were, he developed a fascination with the possibilities of capturing human and animal movement photographically. His earliest efforts, in the late 1870s, involved placing a number of cameras along the side of a track, and and using various mechanical methods to trigger them sequentially as a moving horse passed by them. Showing the result involved laboriously copying the photos as silhouettes on to a disc, from which they were projected using a device which Muybridge invented and called a Zoopraxiscope. The animation above shows a modern rendering of his original images. By the turn of the century integrated, hand-cranked film cameras had been developed, and so, like insects from their pupae, we see the people of over a hundred years ago emerge from their frozen monochrome images into a jerky, half-real life. And in retrospect it seems as if the lack of realism was accentuated as the medium began to be put to use for entertainment. There was already the Victorian tradition of high melodrama, and on top of this actors had to find ways of expressing themselves which did not use sound. The results now appear to us impossibly stilted and artificial. Alongside this, however, entrepreneurs of the time had, luckily for us, spotted another opportunity to exploit the new medium. They realised that if they were to film ordinary people going about their business, those people may well pay a good price to be able to see themselves in an entirely novel way. And indeed they did. So we have a wonderful resource of animated scenes from streets and other public places of the era. Until recently these early examples of ciné verité haven’t been seen very often, and I’m guessing that the most important reason for this is that other limitation on realism – the speed of the original cameras. They were hand-cranked to the highest rate that the early mechanisms would allow, but this couldn’t match the frame rate of later twentieth century equipment. The choice has been either to slow it down and put up with jarringly jerky motion; or the easier way, of simply showing it at the conventional frame rate so that motion appeared much faster. The latter option has been resorted to so often that it has given rise to a trope: accelerated motion equals the past. Even more contemporary footage showing mocked up scenes of an earlier era has sometimes been artificially speeded up, in order to borrow a little authenticity. But with today’s digital techniques that is now changing. Not only can individual frames be cleaned up and clarified, but new frames can be interpolated into the instants between the original ones, slowing bodily movements and restoring a natural appearance. This new realism was what struck me about the scenes I saw of 1920s Germany – but we now have an increasing number of such enhanced early films, going back to around 1900, thanks to those original entrepreneurs. There are a number of examples on YouTube, so I have chosen one to insert here. It shows a selection of scenes in England around 1900. I like to pull the image up to full screen and immerse myself in it, imagining that I am walking the streets of late Victorian or early Edwardian England, and I try unsuccessfully to think the thoughts I might have been thinking if I had really been present then. Although these are humans like us, how do they differ? Well, most obviously in their dress. What always takes my attention is the ubiquity of hats. I searched through this clip for anyone without one. There us one smartly dressed man standing at the back of a very well-heeled looking family group, who has perhaps just stepped out of the door behind him. Otherwise all I could find was one small child (who had probably lost his) and the rowers on the river and (who are stripped down to their sporting gear, with their hats probably safely awaiting them on pegs in the changing room). Evidently if I’d been alive then I would have considered it almost unthinkable to have left the house on even the shortest journey without something on my head – whether I was rich or poor. And even the rowers are followed by another group of men out for an afternoon boat trip, and they are fully hatted and suited as they brandish the oars. I was also taken by the man who appears about 40 seconds into the sequence, approaching the camera while, in an apparently habitual gesture, he strokes back each side of his carefully manicured handlebar moustache. His bearing suggests that he considers himself the epitome of 1900 cool. He unceremoniously sweeps two children out of his way before moving off to the left. That action in itself suggests that a rather less indulgent attitude to children was commonplace then. But looking at urban streets at that time, and allowing for all the obvious differences, there still seems something unfamiliar about the movement of the crowd. I realised what it was when watching the 1920s German footage. At that time, in the inflation-hit Weimar Republic, the streets were full of half-starved unemployed, with little to do but – yes – watch the world go by. The film clip above shows people in a more prosperous time and place, but in most of the street shots you can nevertheless see a number who are just passively standing. Some of course are staring at the novelty of the film camera, but you can see plenty of others just watching in general. Consider what entertainment was available: if you were to stay at home, and were not a reader (many of course never got the chance to be) you either had to make your own entertainment, or go out and find it. And so the street provided the most immediate – and cheapest – way to occupy the mind. In a typical street scene today, virtually everyone would be rushing somewhere unless forced into stasis by a wait for a bus, or by a queue of some sort. And even then they will often be busily talking on the phone or texting. While most of our 1900 public are also on the move, they have to make their way around that now-vanished residue of watchers who are happy to stand and stare at the rest of the world getting to where it wants to get to. And a visual medium in its very earliest form has given us a sense of what life was like without the visual media we are now so used to.